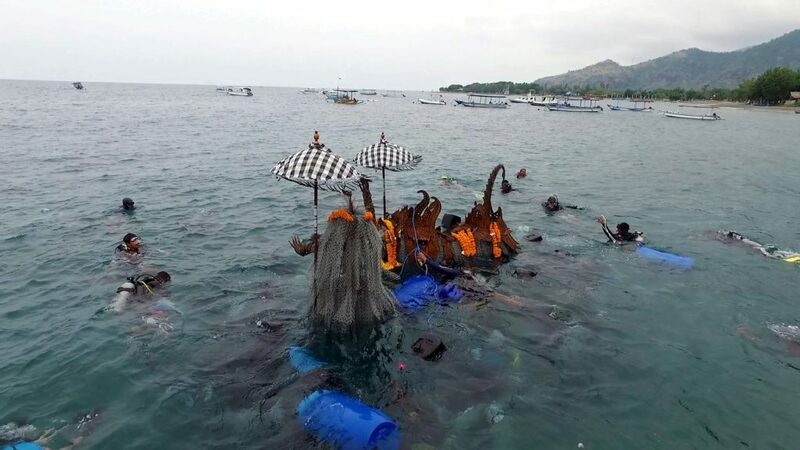 The late Agung Prana, a leader of Balinese ecotourism, was commemorated by installation of a Biorock reef shaped like the quintessential Balinese mythological figures, Barong and Rangda, at the Pemuteran Sea Festival on December 14, 2018. Agung Prana pioneered Pemuteran development based on traditional Balinese philosophy of balance and harmony between humans and nature. His goal was to preserve natural beauty for a serene tourism experience, and regenerating coral reefs was part of that vision. Pemuteran’s peace was the opposite of the constant hustle and bustle in densely crowded tourist areas in the south of Bali, where rice fields are paved over with concrete, beaches fouled with plastic, and you can’t hear the waves over the noise. 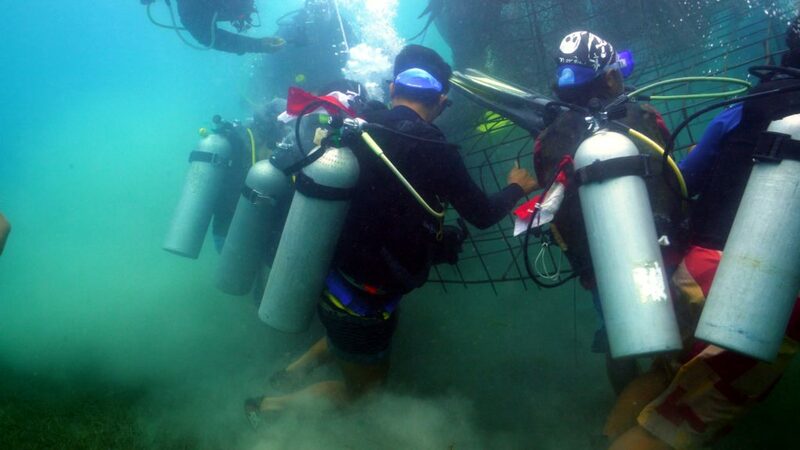 Thanks to Agung Prana’s support, more than a hundred Biorock reefs were built in front of Taman Sari Resort in Pemuteran, each a different size and shape, the largest concentration of reef restoration projects in the world. Pemuteran changed from one of the poorest villages in Bali to one of the most prosperous, because visitors came from all around the world to swim over beautiful corals and spectacular fishes, right in front of the beach. These projects have received many global awards for ecotourism and environmental leadership, including the United Nations Equator Award for Community Based Development, and the Special UN Development Programme Award for Oceans and Community Development. 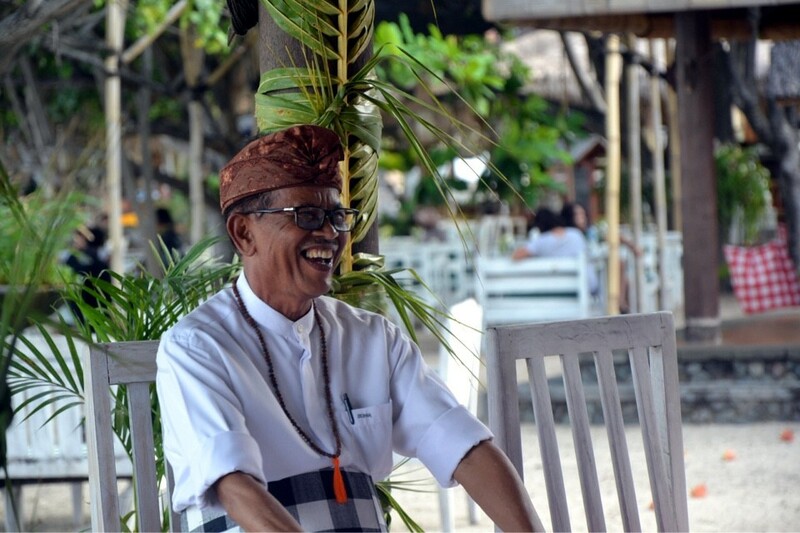 Agung Prana was a traditional Balinese leader from the old kingdom of Mengwi, with major responsibilities in maintaining ancient Balinese culture. 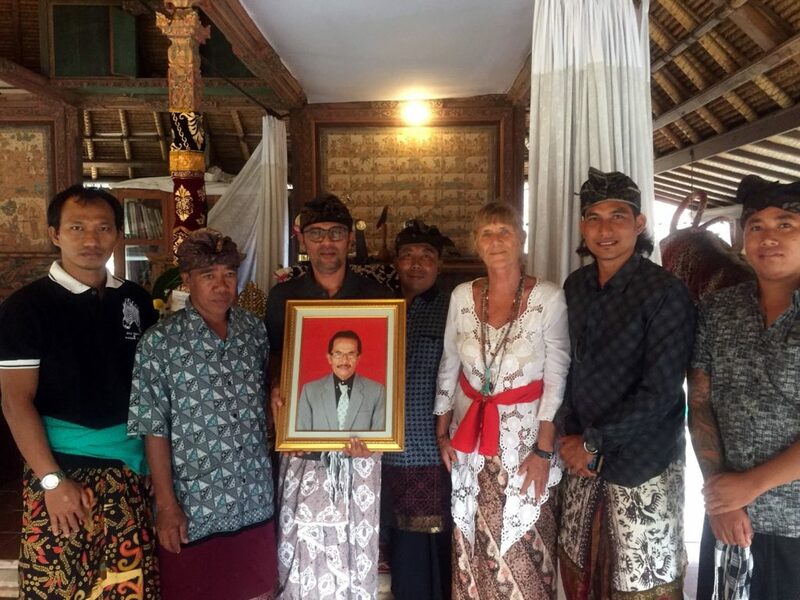 To honour him, the quintessential Balinese Tale of Barong and Rangda was the obvious choice. Barong, the lion who represents Good, confronts Rangda, who represents Evil, in battle to maintain the balance of the universe. The dramatic Barong dance, accompanied by beautiful Gamelan gong orchestra music, tells the most famous Balinese tale, intimately familiar to all Balinese and the core of presentations of Balinese artistic traditions to visitors. 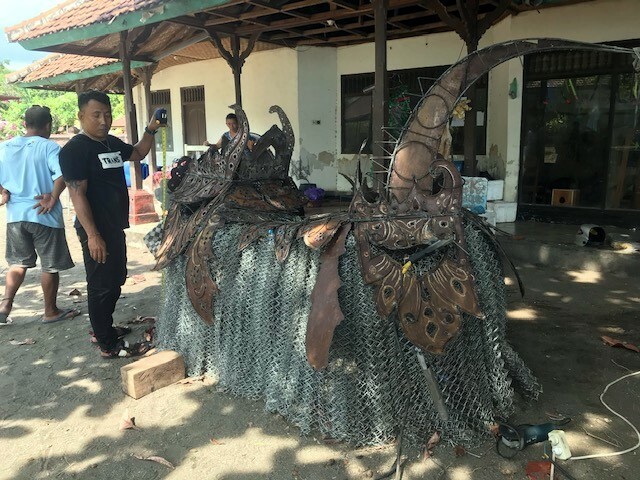 The Barong and Rangda Biorock sculpture was designed and built by Made Gunaksa at the Biorock Centre. The installation team was led by Komang Astika of the Biorock Centre, wearing wearing white shirt at centre. 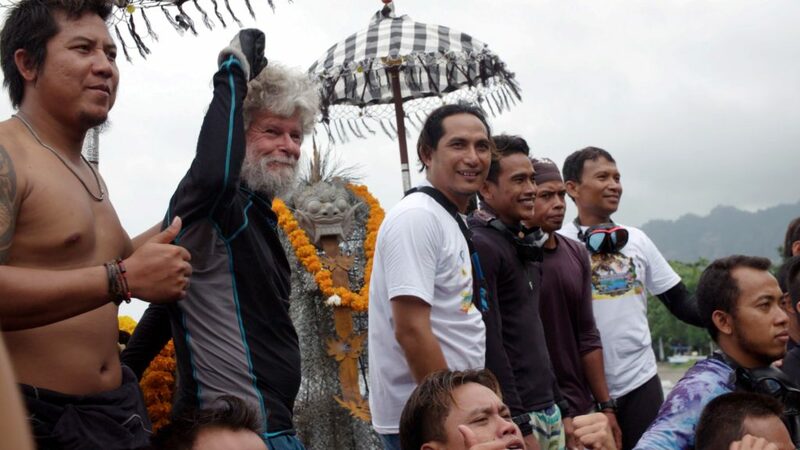 Tom Goreau, scientific advisor to Biorock Indonesia, is at his right, Rangda between them wears a flower wreath, with some of the many volunteer divers. 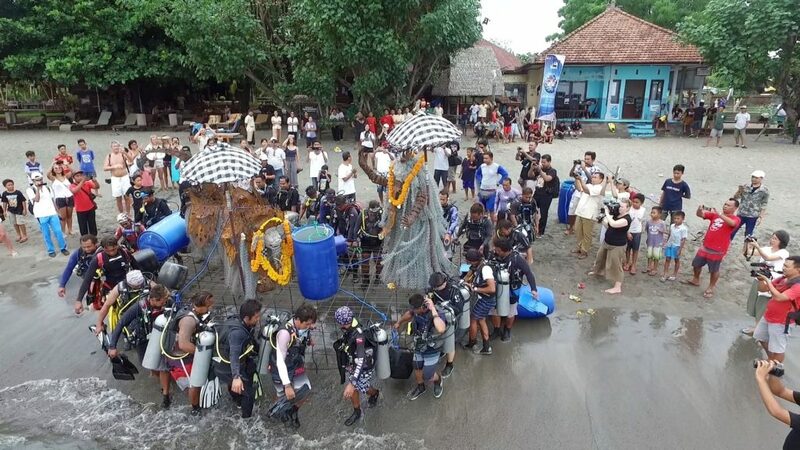 The complete Barong and Rangda Biorock reef structure was borne into the water by a large and enthusiastic team of divers. It was floated with air barrels and swum to the site. It was a truly mythological vision underwater. 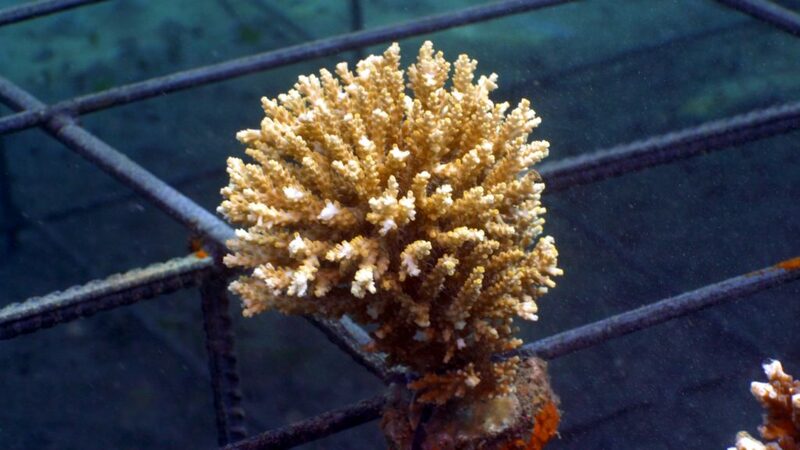 Corals were attached to the reefs. Corals starting to grow on the new reef. 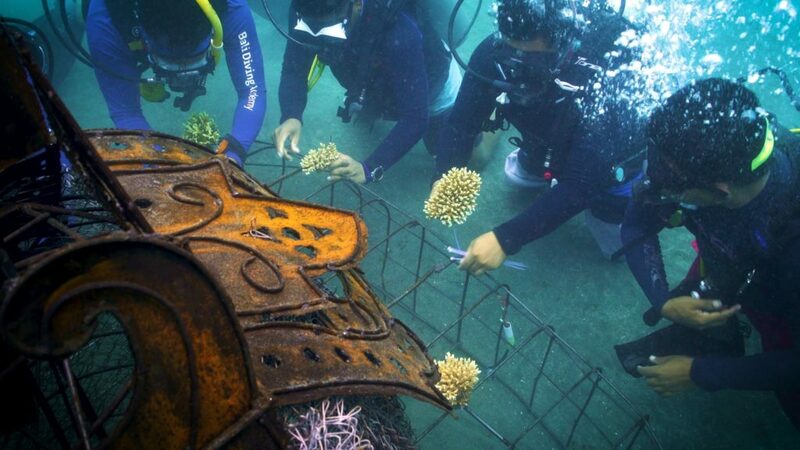 The day after installation and the structure being electrified the rust had vanished from the sheet steel on the Barong and Rangda figures the rebar base had begun to turn white with new limestone growth, and new coral growth could be seen where corals had begun to attach themselves to the structure. 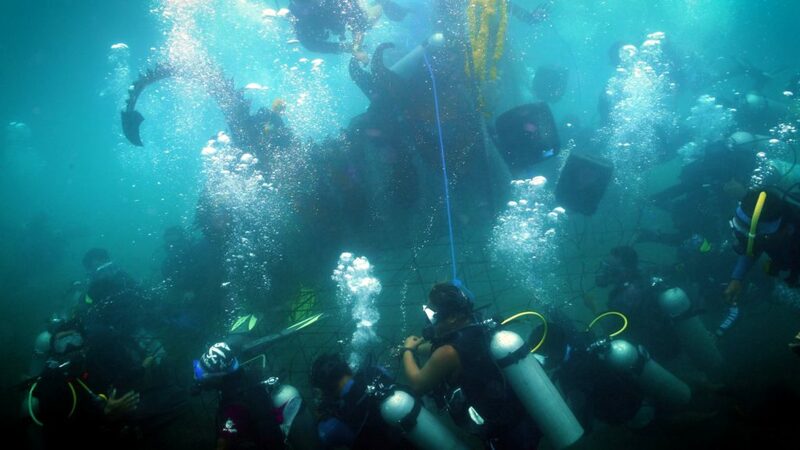 The project uses an innovative new power supply designed by Thomas Sarkisian of the Global Coral Reef Alliance. Measurements the next day after installation showed it was delivering as much direct current trickle charge to the structures as the old power supplies, but using only around one third the alternating current from land. Not only will the more efficient power supplies use much less power, they will also require much less maintenance. 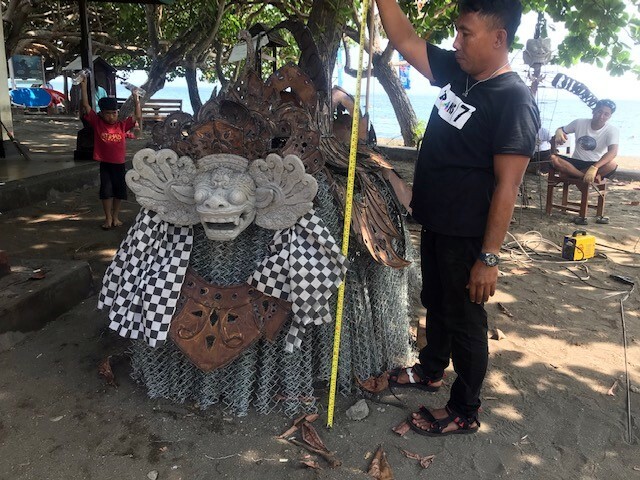 Installation of the Agung Prana Memorial Barong and Rangda Biorock Reef was filmed by Take Action Films from Toronto for their forthcoming film on long term change in coral reefs. 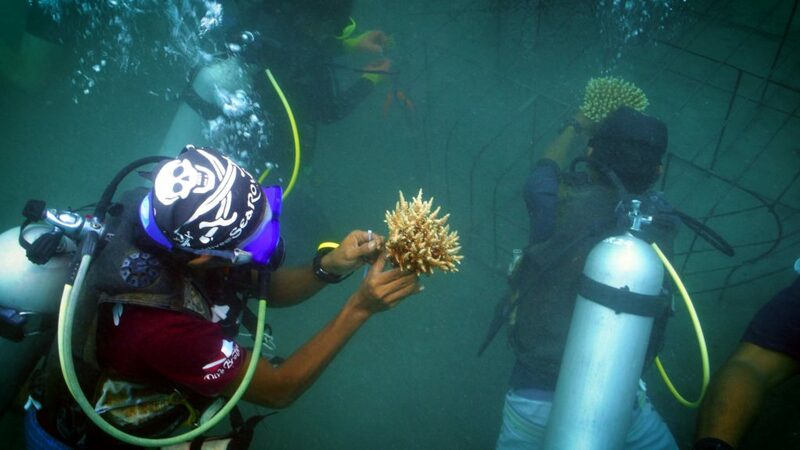 The Global Coral Reef Alliance and Biorock Indonesia thanks the family of Agung Prana, the Biorock Centre staff, Taman Sari Resort, the village and people of Pemuteran, and all the many people, far too many to mention in a report this size, who helped as volunteers and sponsors for helping this unique project to happen. We will periodically post photographs and video of the project.